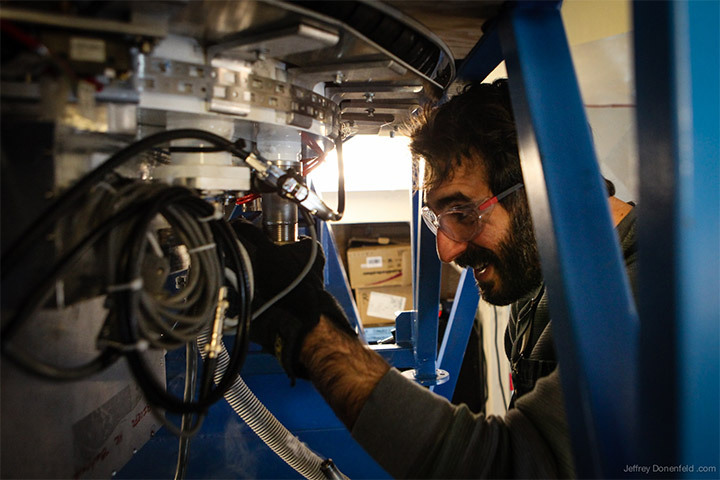 Jonathan Kaufman, a graduate student at UC San Diego, helped to design, build, test and deploy BICEP2. He traveled to the South Pole four times, staying for a couple of months on each visit. He was there at the start of the project, standing on top of the giant crate with a drill to open it and again three years later, in January 2013, to take the telescope off the mount, “warm it up, unplug it, and say goodbye,” he says. In this video from 2012, Kaufman takes blogger Jeffrey Donenfeld for a tour of the site. Antarctica is plenty cold, but the CMB is colder still. It’s 2.7 Kelvin, just a few degrees above absolute zero. To register the signal, a cryogenic system chilled the detectors even more, to 250 millikelvin, “mind numbingly, interestingly cold,” Kaufman says. Cosmologists have detected curling patterns in the faint glow of the universe’s oldest light that appear to be traces left by cosmic inflation, an exponential expansion of the universe thought to have occurred fractions of a second after the Big Bang, they announced today. “If this result can be confirmed, then this is the ‘smoking gun:’ evidence that inflation did occur,” says Brian Keating, associate professor of physics at the University of California, San Diego, who is a member of the consortium that reported the new finding. Jonathan Kaufman, a graduate student, and Angiola Orlando, a former postdoctoral researcher in Keating’s research group were also part of this effort. A paper reporting the results was posted to arXiv, an online repository for “pre-prints,” articles that have not yet been published in a scientific journal. John Kovac of Harvard University leads this team, which includes scientists from Caltech and Jet Propulsion Laboratory, Stanford, the University of Minnesota, and other institutions in Europe and Canada. The evidence comes from observations made by BICEP2, a telescope that operated at the South Pole for three years, continuously scanning the sky for variations in the cosmic microwave background, or CMB. Perturbations in the CMB originate by a variety of means, but one possible source is primordial gravitational waves. “Violent shuddering during inflation would have created ripples in space-time,” says Keating, who is also a member of UC San Diego’s Center for Astrophysics and Space Sciences. We have no way to detect these gravitational waves directly. Instead, cosmologists are looking for the wispy imprint the waves left on this ancient light. Gravitational waves would have twisted the light to form a kind of polarization called “curl-modes” or “B-modes”. A number of things can deflect CMB to create B-modes including the gravitational pull of galaxy clusters and other matter and emissions from the Milky Way galaxy. Even after accounting for these potential effects, a tell-tale pattern in the curl of the light seems to persist in the BICEP2 data. BICEP2 descends from BICEP, a telescope created by Keating and Jamie Bock, an experimental physicist at Caltech and one of the co-leaders of BICEP2. It is a very similar telescope but with a dramatically increased number of detectors that has allowed the team to scan the sky faster and create images with more pixels. Researchers ride snowmobiles out to telescopes at the South Pole. BICEP2 is the upright dish on the right, atop the blue building. The dish to the left is the South Pole Telescope. Keating co-leads a separate collaboration, with Adrian Lee of UC Berkeley, that also hunts for polarization in the CMB using a telescope high in Chile’s Atacama desert. That project, called POLARBEAR, just last week detected B-modes resulting from deflection of the CMB by matter, such as large clumps of galaxies, a way of using the CMB as a backlight to reveal structure in the universe. POLARBEAR can confirm the findings announced today and go deeper when two additional telescopes comprising the Simons Array are added to the project site, the James Ax Observatory, in 2015. 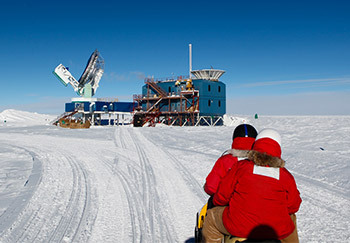 BICEP2 was funded by the National Science Foundation, which also runs the South Pole Station, and the W. M. Keck Foundation. NASA, JPL and the Moore Foundation supported the development of the ultra-sensitive detector arrays. Support for POLARBEAR comes from the National Science Foundation and the Simons Foundation.